This is a great place for your next family vacation. Free high speed internet access. Keyless entry locks for security. This resort offers it all. 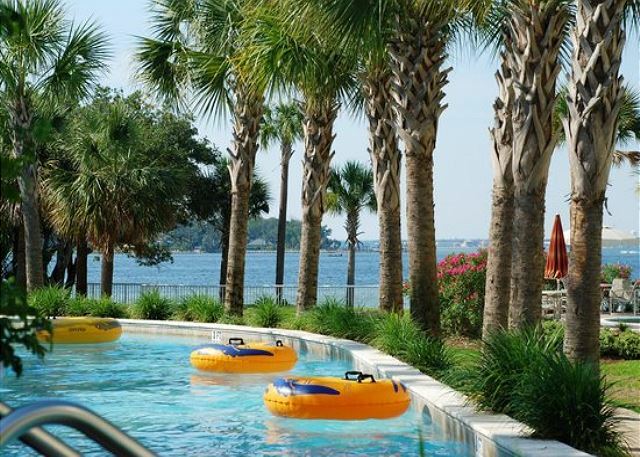 A 700 foot lazy Lagoon River - we even supply the inner tubes! Zero entry pool designed for the little tikes. Beautifully landscaped grounds with seasonally heated waterfall swimming pool on-site as well as 2 extra large hot tubs! 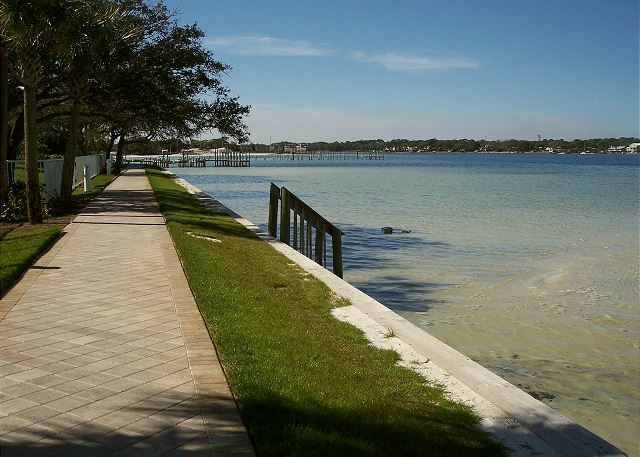 Brand new marina and dock available for sunset strolls and Fishing! The pier is also licensed so guest do not need to purchase a fishing license. The whole property is beautifully lit at night for romantic dining al fresco, the Destin West Bay Resort has everything you need for your next family getaway or romantic weekend. Master Bedroom boosts a King size luxurious bed with its own TV and DVD Player. Corner wrap-around windows with views of the palm trees and balcony access. Huge private full bathroom with separate walk-in shower and jetted bathtub and large walk in closet make this feel like your home away from home. Your guest will sleep in comfortably in this large guest bedroom with Queen size top of the line bedding and easy access to 2nd full bathroom. Large TV with DVD, too. 3rd bedroom houses a brand new bunk bed with full on bottom and twin on top and drawer space on bottom for storage and the kids even have their own flat screen LCD television! Professionally decorated throughout; we have tried to think of everything to make this the place you will want to come back to year after year. Beach chairs, umbrella and towels provided at no additional charge. Undercover parking available. 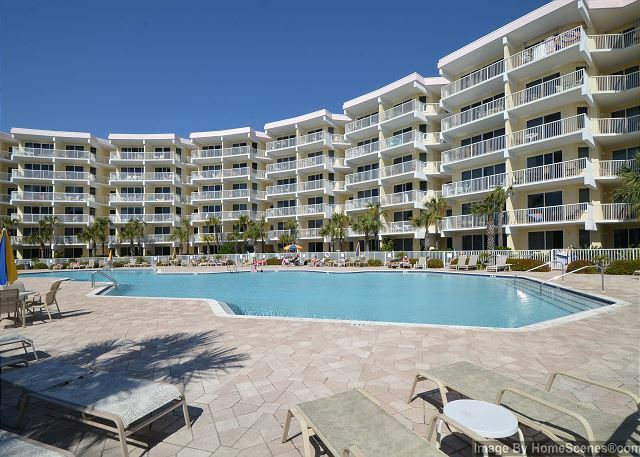 As a guest, you are able to use all the facilities of the Destin West Beach and Bay Resort as well as the amenities across the street on the Beachside (accessed with an elevated pedestrian walkover) The Beachside is just 5 mins from your door. 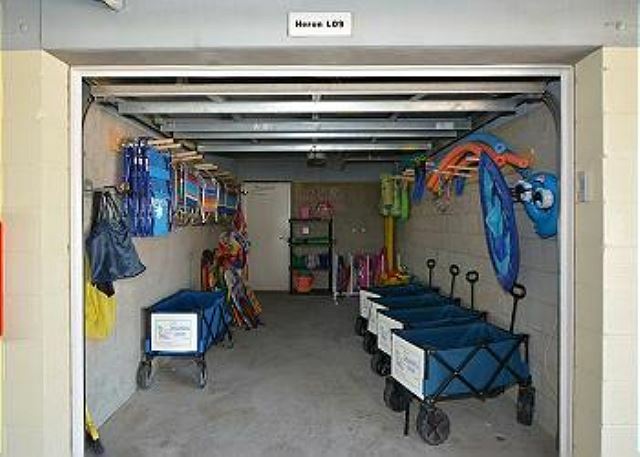 - Beachside amenities include kiddie pool, kiddie spray park and large pool with hot tub. Beachside also has a full newly updated gym facility for your use. Just in case you have forgotten something, a convenient store open 24hrs is located right next door! 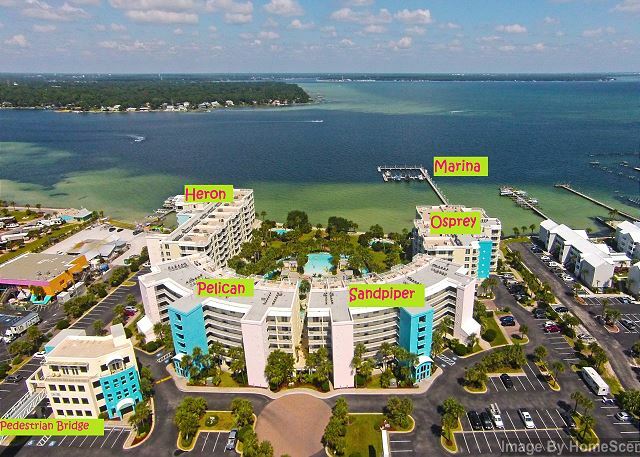 If your looking for things to do but don't care to drive far the area offers several restaurants, bars, water sports attractions, beach rentals, charter fishing, Mini golf, arcades and more all within 1/2 mile radius of your condo. Call us today to book this rental property! Destin is well known as the World’s Luckiest Fishing Village largely because of it roots as a top fishing destination and quick access to deep waters of the Gulf of Mexico. Destin boasts the largest charter fishing fleet in the state of Florida. If you have an interest in charter deep sea fishing – Destin is the place. 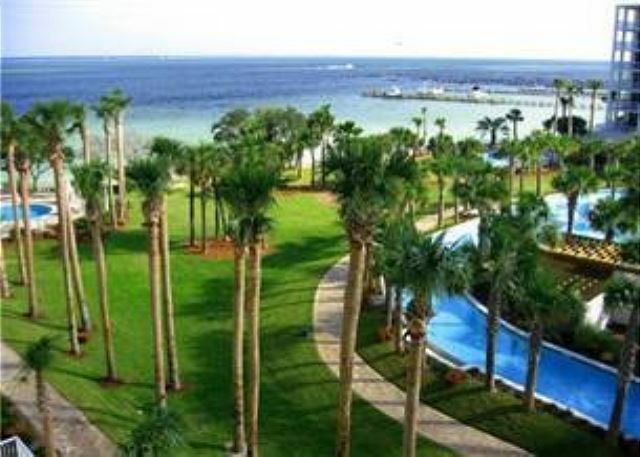 But, there is much more to Destin than charter fishing. 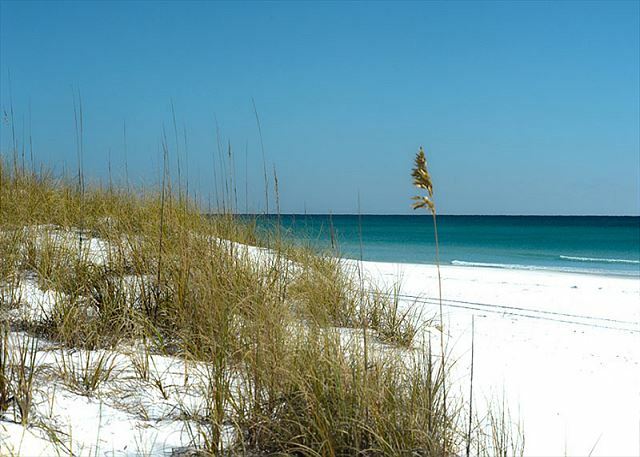 Destin has evolved over the years to be a top beach vacation destination. Featuring sugar white sand beaches and emerald colored water, it is an absolutely beautiful area. The town itself offers many upscale shopping, dining, and entertainment opportunities. IF YOU HAVE FRIENDS OR FAMILY YOU WANT CLOSE BY, we also manage VRBO# 404012, they are one unit apart on the same floor. OR VRBO # 1055757 it is on the same floor as these units. Contact www.destinwestcondos.com to view all available. Rooms Sleeps 9, Large Master bedroom with king bed and private bath. Second bedroom has a queen bed and Bunk beds are in third bedroom. Living room has sleeper sofa. We really enjoyed our stay! We loved the convenience of the pool but also could easily get to the beach for a few hours. Plenty of space for four adults and 2 kids. Our three year old loved the zero entry pool and the lazy river. The whole family loved the lazy river actually! Dear Ms. Getz, We're so happy to know that you and your family loved your stay in 303 Pelican! 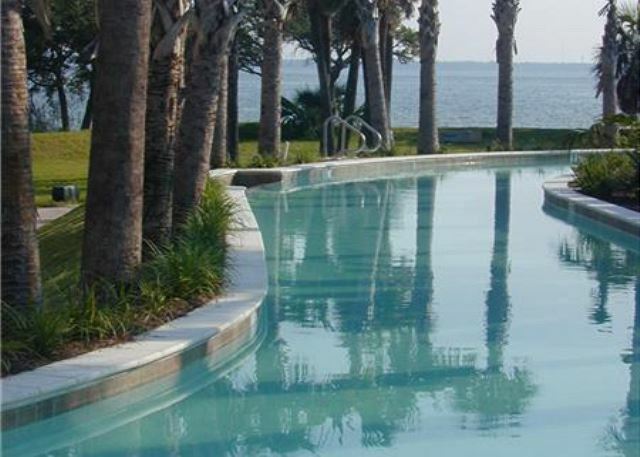 The lazy river and easy beach access keep our guests coming back year after year! We'll be saving your spot for next year, so don't hesitate to call whenever you're ready for another relaxing vacation with your family! Dear Dana, Thank you for taking the time to leave us this review! We love hearing from our guests and are so happy that you'll be recommending us to your family and friends! We're always available to help you plan your next trip! Dear Ms. Calais, Thank you so much for your feedback! I sure wish you had called us about the can opener, because I would have been happy to bring you one! We keep several ready to go in case of instances such as this. During our summer season, it happens that things like can openers and cork screws, etc will visit other condos and never return! We inspect each condo prior to our guests arriving, but may not notice that a can opener is missing from the unit. I truly apologize for this! Just remember for next year that we're always just a phone call away! I was confused about your comments regarding the picture of our bunkroom online. Its the same bunk that we currently have, but I can see how you may have mistaken it for a full size due to the angle of the photograph. With these things noted, I'm so happy to hear that your family enjoyed their stay! We're always here to help you book your next visit and will look forward to having you stay with us again! We had a wonderful time at Destun West Pelican! The condo was spacious and well appointed. Dear Ms. Ott, I'm so happy to hear that you enjoyed your time with us! We'll be looking for your next visit! Everything about the place was great! The condo was clean and convenient to everything. We had easy beach access and the lazy river and pools were awesome. We had three kids with us and had plenty of room and things to do to keep everyone happy. Our second time to stay here and it was fantastic! Our second vacation to spend at Destin west and we absolutely loved it! The location and amenities access is perfect. The staff is super friendly and responsive to needs, questions, and concerns. 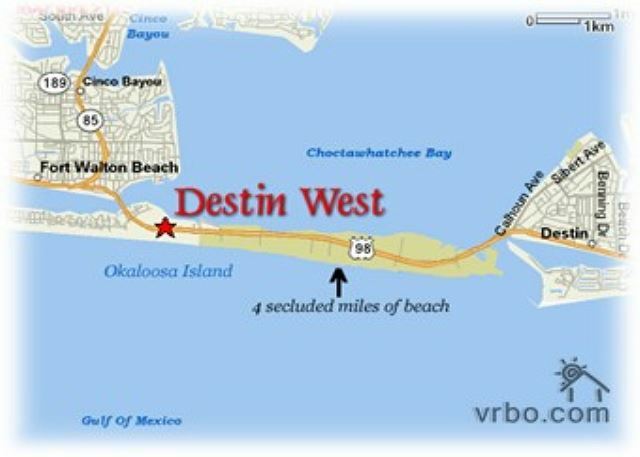 We would highly recommend Destin west to anyone! Thank you for allowing us to stay in your rental! It was everything we expected and more! We had a very good experience! Great location and a great condo! Will definitely stay here in the future. My family of six (2 adults and 4 children) spent a wonderful week in Florida at the Pelican 303 condo. We loved it! 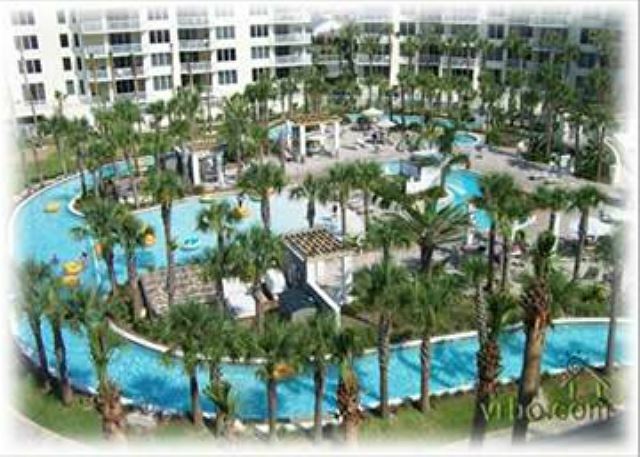 The condo offered everything we needed and was convenient to anywhere we wanted to go. We were walking-minutes to the beach, and driving minutes to shopping, grocery, medical, souvenir shops, etc. Perfect vacation spot! We very much enjoyed the condo and the complex. My only wish is that the pool would open earlier than 9am. We are from the eastern time zone and it felt like a long time for the pool to open in the morning. Other than that, the experience was great. Brought my 2 children and 3 grandchildren and we loved every minute of it. The place was excellent. We're doing it again next year.